To some observers, the aftermarket parts business may seem rather repetitive. After all, it's already been done, right? GLM has significantly expanded its product line by using the most current technology in manufacturing, design and materials. The GLM line now includes gears, empty housings, complete gearcases for outboards and sterndrives, drive shafts, propeller shafts, impeller kits, seal kits, bearings and gaskets, as well as exhaust manifolds and risers. All GLM products are new; never refurbished or rebuilt. Using a highly skilled in-house design team gives the company the ability to produce a replacement part with increased reliability and performance, which is a key advantage in the aftermarket marine parts industry. In this time of economic uncertainty, boaters are looking for the best value when replacing parts or doing repairs, and GLM products deliver a high quality, cost-efficient alternative to OEM parts. 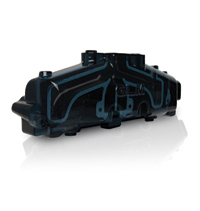 GLM's manifold line offers quality replacement manifolds at consumer-friendly prices. Recent additions to GLM's manifold line include three conversion kits. The first is GLM part number 58990, a kit for converting the old MerCruiser log-style manifold and end riser to the newer center rise manifolds on all MerCruiser sterndrive engines using the GM 5.0 or 5.7 liter blocks. The center rise manifold and elbow set has a larger cooling area and four-inch exhaust elbows which lower exhaust system backpressure, allowing exhaust gases to exit much quicker than with the original three-inch elbow. This new design lets you increase the power and performance of the boat's engine by simply bolting on a new set of manifolds and exhaust elbows. The kit comes with two manifolds and two exhaust elbows, brackets, hardware, gaskets and everything necessary to complete the conversion without having to make any major modifications or remove the engine. A second new kit is GLM part number 58992 for MerCruiser engines with the 4.3L 262 CID V-6. This kit allows you to convert to the new two-piece center rise manifold and four inch elbow combination and replace the single-piece OEM manifolds that are no longer available. Installation is easy, without having to remove the engine or change the Y-pipe. This kit also comes complete with everything necessary to accomplish the conversion, including the manifolds, exhaust elbows, gaskets, hardware and all related parts. A third new offering from GLM is the OMC Cobra 4.3L V-6 conversion kit. Like the MerCruiser V-6 kit, it replaces the single-piece exhaust manifold with a two-piece combination center rise manifold and four inch exhaust elbow. This kit also bolts on without requiring the user to make any major modifications, remove the engine or replace the existing Y-pipe. As with all GLM exhaust manifolds, these three new kits incorporate the separated exhaust ports that essentially tune the manifolds, resulting in a more efficient and better performing engine. All GLM cast iron manifolds and exhaust elbows also carry a three-year limited warranty. Headquartered in Monrovia, Calif., GLM has distributors worldwide to provide its customers with quality GLM parts wherever they may be located. "Our commitment to producing the highest quality product is matched only by our commitment to providing you with the best customer service. Our customer service team is here to provide you with any assistance you may need in placing orders, checking stock or to answer any questions you may have regarding your order," said Mark Warden, General Manager. "At GLM, we are aware that a dealership is a busy place and time is money, so we work hard to make sure your order is processed and shipped in a timely manner. Most orders go out the same day they are placed." GLM invites distributor candidates to contact the company directly to discuss the opportunity to join the GLM team.